Frame #1: Mike Barrowman completes every stroke in a fully streamlined position. His arms are straight with hands slightly overlapped. The shoulders are fully elevated which reduces frontal area. The hips are raised to the surface. The head is pushed well down between the upper arms. His feet are closing inward and at the end of a rising movement to place them on the surface and trailing in the direct "shadow" of the body's cross-sectional area. The feet are slowing and will eventually stop. Frame #2: The swimmer's hands initiate the outward scull. A fully streamlined posture is maintained. The legs trail straight with the feet pointed to maximize streamline. This position illustrates the continuity in power application and development that is a hallmark of Mike Barrowman's technique. As his legs finish kicking the next pull starts. Admittedly, there is very little propulsion in this position but it does illustrate an absence of any excessive overlap of successive strokes, a common fault in many young swimmers. Frame #3: Mike Barrowman's hands are pitched and starting to create propulsive lift force. The path of each hand is out and marginally upward. This is a position where outward scull effort and hand speed acceleration increase. In concert with the effort, the head starts to rise. The body and legs remain in a streamlined position. Frame #4: The width of the outward scull has reached its maximum. The hands are still relatively high. The resulting minor vertical force of the "out and upward" sculling movement supports keeping the shoulders down and hips and legs up, that is, the maintenance of a streamlined position. Frame #5: The arms change direction. Since the hands were carried high on the outward scull, by keeping the elbows up and well away from the body, flexion at the elbows coupled with some medial rotation of the upper arms allows the hands to sweep around and down. The hands gradually change pitch to accommodate the altering direction but still produce a lifting propulsive force. 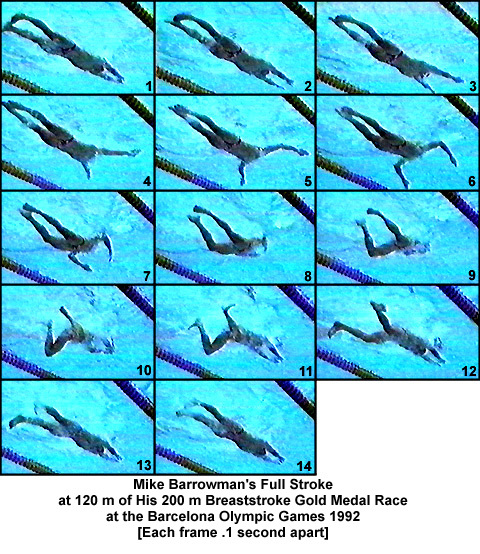 This is a feature that distinguishes Barrowman's stroke from some older depictions (circa 1970's) of the breaststroke arm pull. There is no two-phase outward and inward sculling stroke. The hands, assisted by appropriate changes in position and pitch, produce a continuous propulsive force, particularly "around the turn" (Cappaert & Rushall, 1994). The stabilization of the elbows allows the hands to accelerate. The head continues to rise. The swimmer's body and leg positions are still very streamlined. Frame #6: The inward sculling movement has commenced. The elbows and upper arms have moved little while the hands are still accelerating. The pitch of the hands shows that a resultant lift force will be generated that supports both forward propulsion and lifting of the head and shoulders. The upper torso begins to lift while the head continues its relatively slow elevation. The hips and legs remain streamlined but that is diminishing because of the torso lift, which produces an overall tilting of the swimmer's body and legs. Frame #7: The head and torso continue to rise. The hand position is producing force to support the body/head lift and little is applied to propulsion. The propulsive features of the arm pulls are virtually finished by this time. Once propulsion is "completed," the elbows and upper arms are brought in to the side very vigorously. The knees bend to initiate repositioning the legs to kick. Frame #8: The torso and head are out of the water and a breath is taken. The hips still remain quite high. The angle of the thighs to horizontal is still relatively flat which is a testimony to the swimmer's hyperextension of the lower spine and hip-joint flexibility. The legs start to bend at a faster rate as the swimmer executes the breathing and torso lifting movements as rapidly as possible. Frame #9: The breath has been taken, the torso and head are beginning to be driven down, and the hands are "fired" forward just over the water surface. The legs continue to bend. The feet are beginning to turn out in preparation for the kick. Frame #10: The legs are fully drawn-up, the feet are turned out, and the arms are close to half-way forward on their extension. The partly covered torso continues to be driven down and forward. Frame #11: This frame depicts Mike Barrowman at his best. The torso and hips are level, the arms are being extended straight forward (no vertical component), and the feet are turned fully out at the very commencement of the kick. The kick is fully effective. The feet are in a position to facilitate the largest drag force production (the inner surfaces of the feet, ankle, and shank constitute the propelling surface). The feet are everted to this extent through voluntary action plus the added pressure gained from the force backward on the water. The kick is timed with the rapid extension of the arms forward to attain a streamlined position. Frame #12: Mike Barrowman's effective kick drives a "spear-like" body, head, and arms forward. The head is tucked down between the upper arms. There will be no alteration in the upper-body position for the rest of the kick. The feet drive directly backward. Frame #13: The continued streamlined body, head, and arm position is maintained. The legs' potential effectiveness for developing propulsion has ceased. The kick terminates with the feet being inverted to become more streamlined. Frame #14: The stroke sequence is completed with Barrowman's streamlining still a remarkable feature. Mike Barrowman's stroke introduced the world to several features. It demonstrated how to streamline in breaststroke. Disruptions to that streamline were minimized. The torso was not raised until the inward scull commenced (frame #6), and the return from breathing to flat streamline was exceptionally rapid. Frames #11 through #14 show Mike Barrowman's excellent streamlining during the kick. This feature should not be lost on the reader for it shows how to accentuate this factor and gain great benefit. As much of the stroke as possible was performed with the legs and body aligned in a flat position. The continuity of force production was achieved with both the arm pull and leg kick. The circular vertical movement path of the hands provided conservation of momentum and facilitated high acceleration "around the turn" and on the inward scull. It is noteworthy that much of the force created during the inward scull was used to lift the torso and head. The kick also demonstrated a direct path which facilitated continued force production, acceleration, and a final terminal position close to the water surface and trailing in the body's "shadow." The rapidity of execution of this stroke is remarkable. The total phase which included wide sweeping arm and kicking actions in sequence was completed in 1.2 seconds. The torso and head lift and return-to-streamline was completed in .5 seconds. There are several features of this breaststroke movement that are worthy of emulation and adaptation to individual characteristics.